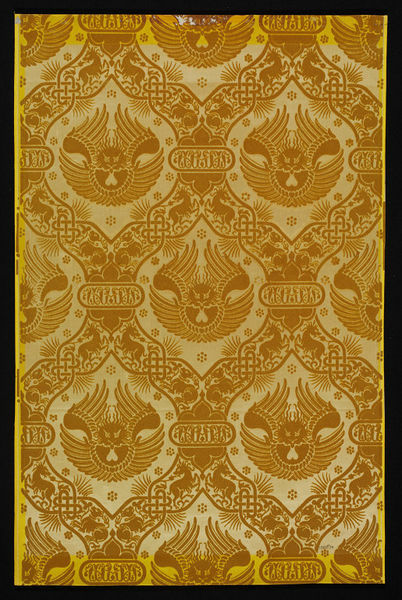 Specimen of wallpaper with birds and animals on a yellow satin ground; Design taken from a 12th-century material; Flock on satin. Given by Monsieur Paul Balin. 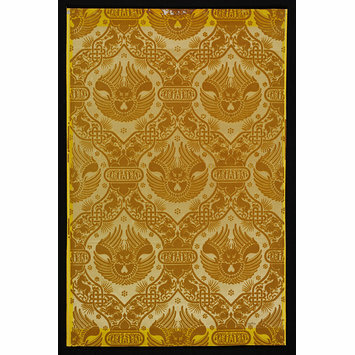 Design based on a mid-13th century Venetian material, formerly in the possession of V. Poterlet. This specimen was exhibited at the Vienna Exhibition of 1873. Specimen of wallpaper with birds and animals on a yellow satin ground; Design based on a mid-13th century Venetian material; Designed by Paul Balin; Flock on satin; Exhibited at the Vienna Exhibition of 1873; Produced by Paul Balin, Paris; 1850-1873.